The Shellfire Box has finally launched. If you haven’t heard of the device before it is an IndieGoGo funded mini VPN router from German VPN provider Shellfire. VPN routers are nothing new and, in a nutshell, they handle a VPN connection inside a hardware device rather than running a standalone VPN client on an individual device such as your computer or phone. The Shellfire Box aims to take this idea and downsize it into a pocket sized and affordable priced device, but have they achieved this? I took a look at the Shellfire Box to find out. 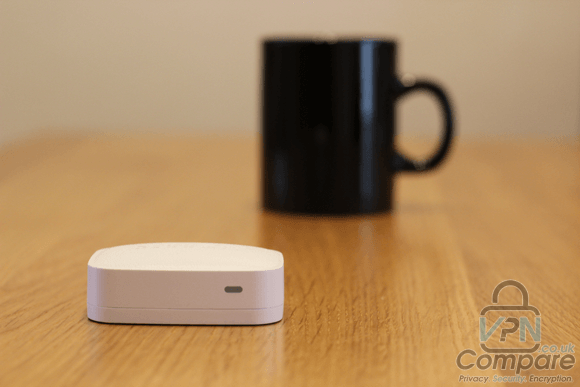 The Shellfire Box is essentially a VPN router that connects to your current modem/router and creates a set of new access points. The device allows one wired connection but also creates a new Wi-Fi access point separate from that of your normal router Wi-Fi access point. What makes the Shellfire Box different from traditional VPN routers and what is currently available on the market is both the palm sized dimensions of the device coupled with the incredibly low price. The Shellfire Box is tiny… and that’s a small cup! If you’re used to using software VPN solutions then the benefit of the device becomes apparent when any device connected by a wired or Wi-Fi connection passes all data through a VPN server without the need for software. This is a big time saver if you want to access a VPN connection over multiple devices without installing individual software on each device. Where it comes into its own is when you have a device such as a TV that can connect to a Wi-Fi connection but does not have the ability to set-up a VPN connection. It’s geo-restriction bypassing heaven. 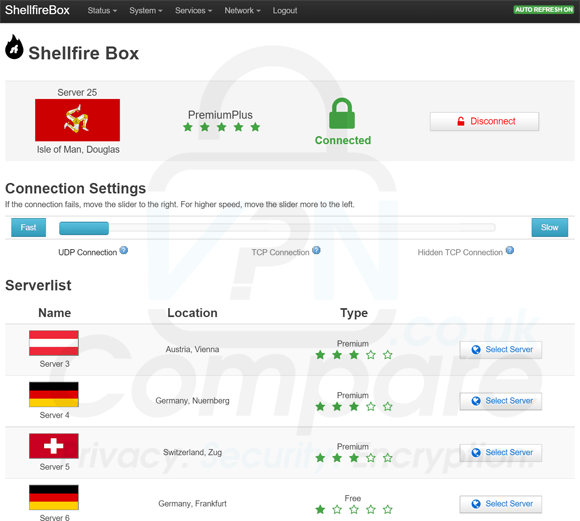 The Shellfire Box brings VPN access to none VPN enabled devices. The Shellfire Box is incredibly easy to set-up and marketed towards those who want a plug in and play device. Once unboxed it is simply a case of attaching a USB power cable to the device and the other end to a USB power source such as your computer tower then connecting the supplied ethernet cable to the Shellfire Box itself and the other end to your current router. The rear of Shellfire Box. After around 30 seconds of LED blinking the box is configured and set-up, there are no user requirements in the set-up process. You could essentially use the Shellfire Box straight away via the new uniquely named Wi-Fi access point that has been created or via a wired connection. The device can be configured by accessing a custom URL via your web-browser (http://sf.box) which contains both a basic and advanced configuration. For the majority of users, the basic configuration will be enough. First off is deciding on which protocol to use from UDP, TCP and a “Hidden TCP Connection”. This is done so via a slider and the interface notes that these range from Fast to Slow. 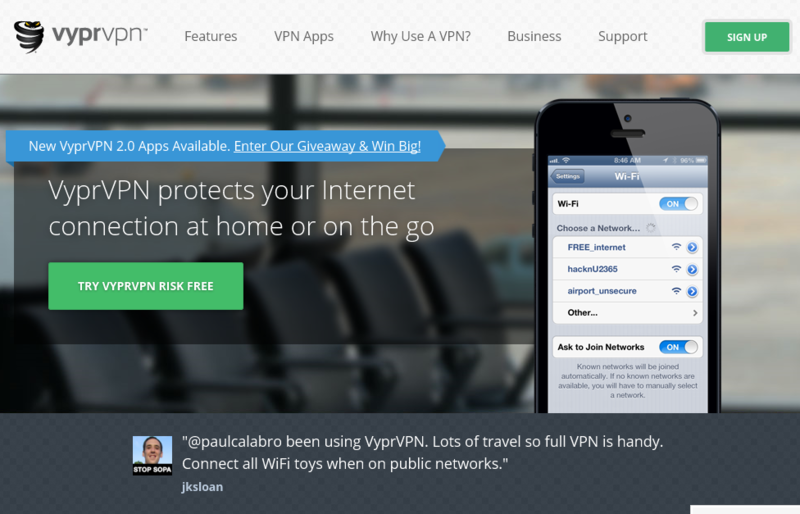 Below this you’re able to select from a range of VPN servers located around the globe. The Shellfire VPN package ranges from Free, Premium to PremiumPlus. The Shellfire Box comes as standard with the PremiumPlus package giving you access to all available servers. Once you’ve decided on the server you wish to use it is simply a case of pressing Select Server and the device takes care of the connection. The Shellfire Box allows access to around 20 different servers located across North America, South America, Europe, Asia and Australia. After using the Shellfire Box for around 2-3 weeks, my overall impression is excellent. For less than the price of some VPN services alone you get the device and a 1 year subscription to the Shellfire VPN service. Having reviewed VPN routers in the past, the biggest single factor has always been speed. VPN routers are often standard commercially available routers with special firmware flashed on top to enable the VPN functionality. Due to this the hardware contained within is not up to the task of handling the encryption and the loss is felt through speed. Unfortunately the same is true for the Shellfire Box with a stated maximum speed of around 13Mbps under prime conditions but I saw a more realistic speed of about 10Mbps. The difference between the Shellfire Box and a usual VPN router and the reason why I feel this isn’t an issue is price and price alone. For €59 (Approx £43 / $65), you not only get the Shellfire Box itself but this also includes 1 year access to their Premium VPN service. When you compare this to most low-end VPN routers that cost upwards of €225 (Approx £164 / $250) just for the hardware itself plus another €40-€80 on top for a decent VPN service then you start to see why the Shellfire Box is a pretty revolutionary VPN device. Due to the maximum speed issues, using the Shellfire Box for high-speed requirements isn’t possible. However for everyday browsing and streaming video it is entirely adequate. While you wouldn’t be able to stream 4K video you can certainly stream in HD quality from most worldwide TV services such as BBC iPlayer, Netflix, and Hulu etc. It’s also up to most other internet tasks you throw at it, just keep in mind the speed limit. The device is incredibly easy to use with extended features for those who want to delve further into the inner workings. The software behind the device is open source allowing the security community to scrutinise it for issues. With the ability to update aspects of the device remotely it appears to be future proofed and allow Shellfire to rectify any issues that may arise in the future. The Shellfire Box packs a lot into its tiny frame and none less so than in the encryption area. The device makes use of the OpenVPN protocol using an AES-256-CBC cipher and SHA1. The control channel is covered by a 2048 bit RSA key and uses TLS-DHE-RSA-WITH-AES-256-CBC-SHA. Encryption is actually very good and in line with encryption standards across most of the commercially available software based VPN solutions. While speeds are obviously limited they are comparable to more expensive VPN router solutions and for the price I’m certainly impressed with what is available. The Shellfire Box is an excellent piece of kit. The price point is outstanding and for a device that opens up the possibility of VPN access to any device that has Wi-Fi capability it is certainly an exciting development. While the device is locked down via the GUI to make use of the Shellfire VPN service only it is possible with some minor technical know-how to access the device remotely and connect to a third party VPN service. I didn’t run into any problems using the Shellfire VPN service via the Shellfire Box itself and it was more than capable of handling the top speeds possible via the device but if you wanted the option to use another provider’s servers then it is available if you know what you’re doing. I would have liked possibly a higher priced product that had the ability to add other provider’s configuration files via the interface but it is understandable that the product has been produced by a VPN company so would want to tailor it to use only their service. The device is easy to use and will be able to be used by even the most novice user. If you want to protect your internet connection on multiple devices or access geo-restricted content on devices that don’t have VPN capability such as your TV then the Shellfire Box may very well just be your answer. Unfortunately due to such a low priced and small product speeds achievable don’t touch much over 10mbps and while this is understandable for a device of this size and price it does mean it is unsuitable for those heavy downloaders or who require fast speeds such as those who wish to stream 4K video. Price isn’t everything but, in this case, it makes the Shellfire Box an extremely worthwhile purchase. While you may not be able to make use of it for every purpose due to the speed limitation it does introduce a protected VPN connection for every device capable of Wi-Fi and for that reason alone I wholeheartedly recommend you pick one up to add to your arsenal of privacy products. Top marks to the Shellfire Team, it’s one product I’ll certainly use on a regular basis. Users wishing to purchase the Shellfire Box can do so directly from the Shellfire Website.